Please give this slip to the auctioneer at time of purchase. Name …………………………. Address ………………………. ………………………………… ………………………………… Lot No. ………………………..
SIGNET RECORDED RAM LAMB (born 2013) Bred by Exhibitor with an index in the top 50% of the National Breed Evaluation. Exhibits limited to two Lambs per flock. CLASS 4 RAM LAMB (born 2013) Bred by Exhibitor. Flock must have previously won Novice Cup. Exhibits limited to two lambs per flock. CLASS 5 PEN OF THREE RAM LAMBS (born 2013) Bred by Exhibitor and from same flock. Exhibitors limited to ONE PEN per flock. CLASS 6 CHAMPIONSHIP First and Second place animals out of each class eligible, with the exception of Class 5 in which 6 animals are eligible. CUPS AND SPECIAL AWARDS SILVER PERPETUAL CUPS TO BE COMPLETED FOR ANNUALLY: The Kinbally Cup presented by the late Mr D H Magill for the best Shearling Ram bred by a member of the Northern Ireland branch. The Robert H Stewart Memorial Cup presented in memory of Robert Stewart, for the 1st prize Farm Recorded Ram Lamb. Suffolk Novice Cup presented by Messrs R J Allam Ltd for the best Ram Lamb, property of and bred by a member who has never previously gained this award. This cup will be awarded whether the animal is sold or unsold. Suffolk Sheep Society Cup for the best Ram Lamb (Class 4) bred in Northern Ireland by a member of the Northern Ireland Branch Suffolk Sheep Society who must previously have won the Novice class. Cup presented by Mr Arthur N Bocock for the best Ram in the Shearling Ram and Ram Lamb classes. The Allam Cup for the best pen of Three Ram Lambs. The Norman Orage Cup for the Supreme Champion. The Blossomhill Cup presented in memory of Stanley Wallace, for the highest priced Ram Lamb sired by a Northern Ireland bred Ram. Championship Awards Supreme Champion won by ………………………………………………………. Reserve Supreme Champion won by ……………………………………………. PWN:12:016 Twin Born: 21/01/2012 Sire: FORKINS FANTASTIC (95645) Dam: AOR:N12 by CAIRNESS NEW APPROACH (93355) G.Dam: HJW:F109 by BORELAND BUDDAH (89548) Notes: Winner of Novice Cup and Reserve Champion at Premier sale 2012. NSN:12:030 Single Born: 01/02/2012 Sire: CAIRNESS SEE THE STARS (94046) Dam: NSN:N1 by STRATHISLA STONER (92716) G.Dam: KPC:K27 by BIRNESS FIRST CHOICE (92328) Notes: Sire 20,000gns Sea the Stars. Used on flocks commercial ewes as a lamb last year. 56C:12:009 Twin Born: 28/12/2011 Sire: BAILEYS BACCHUS (94124) Dam: 56C:K11 by SHANVIN SYRACUSE (90676) G.Dam: HJW:F84 by BORELAND BUDDAH (89548) Notes: This ram was used last year on Cheviot X ewes. Notes: Dam was top priced ewe at Bawnogue reduction sale. Sire sold at Stirling for 7,000gns. JFF:13:063 Embryo Born: 07/01/2013 Sire: CAIRNESS CYCLONE (94939) Dam: JFF:L92 by STRATHISLA SHADRACH (93243) G.Dam: JFF:J51 by BAILEYS BARRACUDA (91690) Notes: Full brother to 7000gns Lakeview Gold Rush Reserve Champion Stirling sold to Birness, maternal sister to ewe lamb sold to Cairness. JFF:13:070 Triplet Born: 07/01/2013 Sire: CAIRNESS CYCLONE (94939) Dam: JFF:J150 by STRATHISLA LIFT T'THE STARS (92223) G.Dam: JFF:A12 by BURNVIEW RISING STAR (84095) Notes: Dam is maternal sister to 6000gns Lakeview Lancelot, full brother to one of our top lambs this year sold privately to Sean Oconnor, Kerry. DRX:13:018 Twin Born: 02/01/2013 Sire: CAIRNTON CHAMPION (92614) Dam: DRX:K45 by BAILEYS BORDEAUX (92632) G.Dam: BOJ:H19 by CAIRNESS COOL CAT (90409) Notes: Sire 12000gns Edinburgh Champion. Dam by 7200gns Baileys Bordeaux. DRX:13:023 Twin Born: 03/01/2013 Sire: CAIRNTON THE CRACKER (96294) Dam: DYH:11:110 by CAIRNESS ACHIEVEMENT (94170) G.Dam: DYH:J109 by STRATHISLA SCHUMACHER (91832) Notes: Sire sold Stirling 2012 for 10,000gns. Dam purchased Conveth dispersal. Notes: ET brother to our lead Shrewsbury lamb and brother to 2,200gns MLC lamb at Stirling last year. Notes: ET brother to one of our top Stirling lambs. Dam bred 2,300gns ram lamb. Notes: Dam bred former very successful show ewe lamb N52. Young lamb born late January. REFERENCE TO SIRES – Forkins Ferrari II - Purchased for 4,000gns at Ballymena sale. Has proved to be an excellent breeder with sons selling at 3,200gns, 2,400gns and 2,000gns and daughters to 3,050gns and 2,800gns. Shannagh Resolve - Purchased at Roscrea for the top price of 11,000 euro where he was Reserve Champion. His dam was sold for 3,750gns as a ewe lamb. Bred well in his first season with sons selling at 2,200gns and 2,000gns. Cairness Sapphire - Purchased at Stirling last year for 10,000gns where he was the top Cairness lamb and one of the 1st prize pen of 3. Bred very well in his first season having sired the 1st prize ram lamb, Male Champion and Reserve Champion at NI Championships. Cairness Liam - One of the most successful sires in the breed. Former Sire of the Year with sons selling at 90,000gns, 16,000gns and 10,000gns. KPC:13:040 Embryo Born: 31/12/2012 Sire: RHAEADR RING-A-DING (96227) Dam: HJW:J49 by RHAEADR ROSSI (91772) G.Dam: DDY:D23 by MUIRESK MOMENTO (88510) Notes: Dam J49 purchased from Baileys for 1000gns by Smiddiehill Flock. ET brother 5th prize at RUAS 2013. KPC:13:022 Embryo Born: 29/12/2012 Sire: RHAEADR RING-A-DING (96227) Dam: KPC:H18 by KINGS THEATRE (90375) G.Dam: KPC:D9 by CROSEMANOR JUBILEE KING (ET) (87327) Notes: ET brother to first prize tup lamb RUAS 2013 and Reserve Overall Champion, Dam H18 daughters sold to 3800gns and sons to 2800gns. KPC:13:034 Embryo Born: 29/12/2012 Sire: RHAEADR RING-A-DING (96227) Dam: KPC:L18 by STRATHISLA STONER (92716) G.Dam: KPC:J12 by BIRNESS FIRST CHOICE (92328) Notes: Dam L18 from same family as KPC:F25. Dam of 7,500gns Limestone Nuggett and 7000gns Limestone To-Tal. KPC:13:053 Twin Born: 06/02/2013 Sire: BALLYCOOSE BIG BEN (96228) Dam: KPC:H18 by KINGS THEATRE (90375) G.Dam: KPC:D9 by CROSEMANOR JUBILEE KING (ET) (87327) Notes: Young lamb, dam H18 also dam of 2800 Habana, Keep er Lit, Matador, Adventure and ewe lamb sold 2012 for 3800gns. KPC:13:036 Embryo Born: 30/12/2012 Sire: RHAEADR RING-A-DING (96227) Dam: KPC:L3 by STRATHISLA STONER (92716) G.Dam: KPC:F25 by CASTLEWELLAN TONTO (90529) Notes: Dam L3, ET sister to 7000gns To-Tal. KPC:13:029 Twin Born: 28/12/2012 Sire: RHAEADR RING-A-DING (96227) Dam: KPC:K7 by KINGS THEATRE (90375) G.Dam: KPC:D12 by LIMESTONE CASANOVA (88828)# REFERENCE TO SIRES – Rheadar Ring A Ding cost 18,000gns Stirling 2012, sired by record holder 90,000gns Arbenning. Ring A Ding made excellent start as breeder siring both first prize tup lambs, champion male and reserve overall champion at RUAS and Royal Highland. His twin brother sold for 8000gns Kelso. Ballycoose Big Ben - sired by 5500 Royal Edition. Big Ben purchased Ballymena 2012 for 1400gns, Reserve Champion Stock Ram NI Flock Competition 2013 and overall Supreme Champion at Saintfield Show 2013. BSH:13:066 Twin Born: 03/01/2013 Sire: WHITESTONE RORY (95473) Dam: BSH:N44 by DONRHO STAR (93512) G.Dam: BSH:K24 by RHAEADR CHABAL (92612) Notes: Whitestone Rory purchased at Shrewsbury 2011 for 7000gns. Sired by Cairness Liam whose sons have sold for 90,000gns Ardlea Arbenning. BSH:13:038 Single Born: 01/01/2013 Sire: FORKINS FERRARI II (95118) Dam: 73A:L87 by STRATHBEG STAN THE MAN (93401) G.Dam: FNV:H109 by GLENHO GURKHA (90696) Notes: Dam 73A:L87 was my show ewe last year. Forkins Ferrari II purchased for 4,000gns. PAO:13:007 Embryo Born: 01/01/2013 Sire: ROOKERY ROONEY (95596) Dam: PAO:K7 by CARRAGH BEST (93121) G.Dam: KOT:F8 by GLENHO GLADE (90167) Notes: K7 best breeding ewe in the flock, has bred lambs to £3800 at Stirling. S38:13:018 Embryo Born: 01/01/2013 Sire: BALLYCOOSE BIG BEN (96228) Dam: HJW:J49 by RHAEADR ROSSI (91772) G.Dam: DDY:D23 by MUIRESK MOMENTO (88510) 20wk wt 20wk musc. 20wk fat EBV's: 6.95 0.46 0.29 Index 1.70 Actual: 99.00kgs 38.30mm 8.30mm Age 164days Notes: Sire 2nd placed Stock Ram N.I. Flock Competition 2013 and Res Interbreed Champion Saintfield Show 2013. S38:13:007 Embryo Born: 27/12/2012 Sire: BALLYCOOSE BIG BEN (96228) Dam: HJW:J49 by RHAEADR ROSSI (91772) G.Dam: DDY:D23 by MUIRESK MOMENTO (88510) 20wk wt 20wk musc. 20wk fat EBV's: 3.85 -0.06 0.18 Index 0.81 Actual: 85.00kgs 35.01mm 7.90mm Age 169 days Notes: Full brother to previous lot. S38:13:070 Single Born: 28/01/2013 Sire: STOCKTON DYNAMITE (95686) Dam: S38:11:054 by THREEWAYS TRANSFORMER (91874) G.Dam: HJW:J49 by RHAEADR ROSSI (91772) 20wk wt 20wk musc. 20wk fat EBV's: 9.08 1.89 0.40 Index 2.49 Actual: 81.00kgs 37.50mm 5.5mm Age 137days Notes: Sire breeding very well. 3rd placed Stock Ram 2012 N.I. Flock Competition. S38:13:009 Twin Born: 28/12/2012 Sire: SLACKADALE DISCOVERY (96285) Dam: S38:N63 by THREEWAYS TRANSFORMER (91874) G.Dam: S38:K64 by STOCKTON ROYAL STAR (91875) 20wk wt 20wk musc. 20wk fat EBV's: 7.04 2.01 0.31 Index 2.06 Actual: 87.50 kgs 40.90 mm 7.70 mm Age 168 days Notes: Top muscle scan in flock. Sire's muscle scan 44.1. Index 2.44. Twin to a show ewe lamb. S38:13:015 Twin Born: 29/12/2012 Sire: SLACKADALE DISCOVERY (96285) Dam: S38:N30 by SMIDDIEHILL GOLDWYN (94150) G.Dam: S38:K45 by SMIDDIEHILL CARDINAL (92742) 20wk wt 20wk musc. 20wk fat EBV's: 6.18 0.81 0.22 Index 1.60 Actual: 83.0 kgs 35.50 mm 6.60 mm Age 167 days Notes: Dam a 1st prize winner Castlewellan Show 2010. S38:13:013 Twin Born: 29/12/2012 Sire: BALLYCOOSE BIG BEN (96228) Dam: S38:N4 by STOCKTON SENSATION (92743) G.Dam: S38:J30 by STOCKTON ROYAL STAR (91875) 20wk wt 20wk musc. 20wk fat EBV's: 3.69 0.77 -0.05 Index 0.87 Actual: 78.50 kgs 37.90 mm 6.00 mm Age 167 days Notes: This pen of lambs are being presented completely untrimmed and in their natural state and are on the Heptavac P system with their booster given April 30th. AOR:13:015 Embryo Born: 31/12/2012 Sire: BIRNESS BACARDI (96316) Dam: AOR:K15 by BAILEYS AND ICE (92781) G.Dam: AOR:W24 by KILLAIRE SOVEREIGN (81001) Notes: Dam bred Ferrari at Burnview and Favourite at Hallhill and Westcarse. AOR:13:004 Embryo Born: 30/12/2012 Sire: BIRNESS BACARDI (96316) Dam: AOR:F28 by CAIRNESS SCHOLES (89552) G.Dam: AOR:W24 by KILLAIRE SOVEREIGN (81001) Notes: Birness Bacardi purchased £12,000 Stirling 2012. Breeding very well in first season. AOR:13:020 Embryo Born: 31/12/2012 Sire: BIRNESS BACARDI (96316) Dam: AOR:N19 by CAIRNESS KANINE (93354) G.Dam: AOR:F28 by CAIRNESS SCHOLES (89552) Notes: Lost Dam at 5 weeks. E.T. brother to my show ewe lambs and two brothers for Stirling. AOR:13:045 Embryo Born: 14/02/2013 Sire: CAIRNESS KANINE (93354) Dam: AOR:F28 by CAIRNESS SCHOLES (89552) G.Dam: AOR:W24 by KILLAIRE SOVEREIGN (81001) Notes: Young ET lamb, Full brother to £5000 ewe sold Ardlea dispersal. PWN:13:029 Embryo Born: 01/02/2013 Sire: RHAEADR RING-A-DING (96227) Dam: T86:N6 by STRATHISLA STONER (92716) G.Dam: T86:J39 by KINGS HIGH AND MIGHTY (89280) Notes: Rhaeadr Ring A Ding purchased jointly at Stirling 2012 for 18000gns. NSN:13:015 Embryo Born: 29/12/2012 Sire: SHANNAGH RESOLVE (95757) Dam: CFJ:K16 by STRATHISLA DYLAN THOMAS (92528) G.Dam: CFJ:F60 by KINGS HIGH AND MIGHTY (89280) Notes: All lambs are vaccinated with Heptavac-P and have not been fed on cabbages. PDH:13:013 Single Born: 30/12/2012 Sire: CAIRNTON THE CRACKER (96294) Dam: DYH:L113 by STRATHISLA SCHUMACHER (91832) G.Dam: DYH:H36 by CAIRNESS SAVE THE DAY (90698) Notes: Sire Cairntun The Cracker sold for £10,000 Stirling 2012. Dam L113 Champion Suffolk Newry Show 2013. PDH:13:015 Twin Born: 26/12/2012 Sire: CAIRNTON THE CRACKER (96294) Dam: DYH:11:107 by CAIRNESS ACHIEVEMENT (94170) G.Dam: DYH:K127 by DEVERONSIDE WHISTLEBLOWER (92758) Notes: First prize Ram Lamb at Lurgan Show, also 1st prize and Male Champion at Newry Show. 111 LRT:13:040 Embryo Born: 02/01/2013 Sire: BIRNESS BOLT (96202) Dam: LRT:11:008 by BAILEYS PADDY'S POWER (94737) G.Dam: LRT:K15 by BIRNESS STARCRACKER (93192) REFERENCE TO SIRE – Birness Bolt purchased at Stirling 2012 for 20,000gns. A very strong boned ram with exceptional carcass, style and presence. Has been judges Best Stock Ram in the National Flock Competition 2012 also in the North Antrim East L/Derry Flock Competition 2012, and recently in the N.I. Flock Competition 2013. Philip Gurney 20 Ruskey Road, Aghadowey, Coleraine, Co Londonderry, BT51 4AH Reg. Flock Code FSC Oakbridge 123 FSC:13:010 Twin Born: 27/12/2012 Sire: CAIRNESS CLASSIC FYVIE (94909) Dam: JFF:J130 by STRATHISLA LIFT T'THE STARS (92223) G.Dam: JFF:A10 by BURNVIEW RISING STAR (84095) Notes: Dam purchased from Lakeview. Great breeding line. 125 FSC:13:005 Single Born: 27/12/2012 Sire: CAIRNESS CLASSIC FYVIE (94909) Dam: FSC:L1 by OAKBRIDGE KAUTO STAR (92675) G.Dam: FSC:J32 by WELLS MIGHTY HIGH (92226) Notes: Dam is a super ewe with great colours. REFERENCE TO SIRE – Cairness Classic Fyvie sold in Edinburgh 2010 for 10,000gns. J S Hamilton Prospect House, 21 Dunlady Road, Dundonald, Co Down, BT16 1TT Reg. Flock Code 56C Fort 134 56C:13:001 Single Born: 28/12/2012 Sire: BEGNEY BRUTUS (96358) Dam: 56C:11:010 by BEGNEY BOUNCER (95104) G.Dam: 56C:J5 by SHANVIN SYRACUSE (90676) Notes: Dam 56C:11:010 Largest ewe in flock very clean and correct on her legs. Elizabeth & James Gould Shanlongford, 110 Boleran Road, Garvagh, Co Londonderry, BT51 4HT Reg. Flock Code 49J Ringsend 136 49J:13:005 Single Born: 04/01/2013 Sire: CARONY GOES GOLD (96440) Dam: 49J:N26 by CASTLEWELLAN KELTIC FUSION (93579) G.Dam: 49J:C14 by BAWNOGUE ICON (87798) Notes: Sire by 2011 Reserve Champion at the National Sale. 137 49J:13:001 Single Born: 30/12/2012 Sire: CARONY GOES GOLD (96440) Dam: 49J:J59 by MEIKLESON E-MALE (89662) G.Dam: 49J:D44 by BAWNOGUE ICON (87798) Notes: Carony Goes Gold 2nd highest priced ram lamb at N I Premier 2012. 143 8B:13:010 Twin Born: 27/12/2012 Sire: BIRNESS PURE GENIUS (95657) Dam: 8B:11:020 by BAILEYS BACCHUS (94124) G.Dam: 33H:K79 by BAILEYS GOLDEN STAR (92619) Notes: G/Dam purchased from J Douglas. 144 8B:13:020 Embryo Born: 28/12/2012 Sire: BIRNESS PURE GENIUS (95657) Dam: 8B:K22 by BIRNESS THE GREAT (92067) G.Dam: KCT:H7 by BLACKHALL GOLIATH (88850) Notes: Full brother to top priced lamb last year sold to Bannow Flock South of Ireland. 145 8B:13:049 Single Born: 29/12/2012 Sire: CONVETH STYLIST (95658) Dam: 8B:L6 by DEVERONSIDE WHISTLEBLOWER (92758) G.Dam: 8B:H3 by CONVETH CUCHULAINN (88969) Notes: Conveth Stylist purchased Stirling 2011. Tremendous bodied sheep. 146 8B:13:002 Twin Born: 25/12/2012 Sire: BIRNESS PURE GENIUS (95657) Dam: HJW:K86 by RHAEADR ROSSI (91772) G.Dam: DDY:D64 by CAIRNESS THUNDER II (88474) Notes: His dam purchased from Baileys flock. 148 DBB:13:017 Twin Born: 28/12/2012 Sire: RHAEADR RED BULL (95913) Dam: JFF:11:126 by LAKEVIEW LIEUTENANT (94978) G.Dam: JFF:K53 by SHANNAGH SHERGAR (92745) Notes: Dam purchased from Lakeview as a ewe lamb. Twin entered for National sale. 150 DBB:13:067 Single Born: 09/01/2013 Sire: RHAEADR RED BULL (95913) Dam: DBB:L24 by CONVETH ROYAL FLUSH (93706) G.Dam: DBB:F21 by KINGS HIGH AND MIGHTY (89280) Notes: Full brother to last years 1500gns lamb. 154 DBB:13:073 Twin Born: 14/01/2013 Sire: RHAEADR RED BULL (95913) Dam: DBB:11:001 by MUIRESK DANCING BRAVE (77044) G.Dam: DBB:L20 by CONVETH ROYAL FLUSH (93706) Rhaeadr Red Bull purchased for 7,000gns at National 2011. 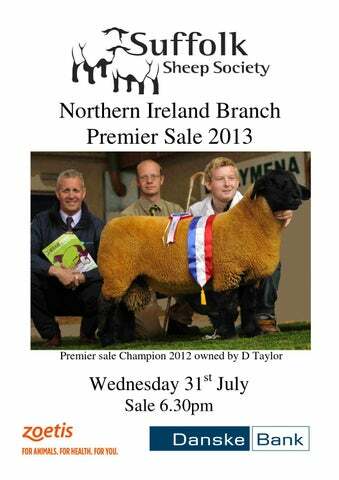 Has bred lambs to 4,000gns at National and 1500gns at Ballymena. Notes: Very tight wooled correct lamb from a classy dam. Notes: Sea the Stars £20K at Edinburgh. the purchase price and the cost of transport of the animal from the buyer's premises to the seller's premises and the veterinary surgeon testing fees incurred by the buyer. The seller shall not be liable for any indirect or consequential loss howsoever sustained by a buyer. As to clauses 17.4 and 17.5 and 17.6 time is of the essence. The seller and the buyer may vary the provisions of clauses 17.4, 17.5, 17.6, 17.7 and/or 17.8 if but only if and insofar as the variation is set out in writing and signed by each of the parties. The terms of any statutory enactment or custom or trade which are inconsistent with the provisions of this Bye-law 17 are hereby excluded. Failure to comply with any of Bye Law 17 will allow the Society, at its discretion, to cancel Society membership. Society Bye Laws do not exempt a breeder from the Sale and Supply of Goods Act. DISPUTES 1. All disputes of differences of any kind which arise at or in relation to the auction either between the vendor and the purchaser or amongst bidders themselves shall be referred to the auctioneer and his decision shall be final and binding on all parties. 2. Any other dispute shall be referred to an arbitrator who shall be appointed, failing agreement between the parties, by the Society and the decision of the arbitrator shall be final and binding on all parties to the dispute. Any arbitration under this clause shall be subject to the Arbitration Acts for the time being in force. CONDITIONS OF SHOW OR SALE 1.Each item must be bona fide the property of the exhibitor. 2.The highest bidder to the buyer, and if any dispute arises between the bidders, the decision of the Auctioneer shall be final, or at his discretion the lot in dispute shall immediately be put up again and resold. The Auctioneer reserves the right of refusing the bid of any person and regulates the bidding, and no bidding is to be retracted. 3.The purchasers to give their names and places of abode in writing and pay the full purchase money for each lot at the fall of the hammer (if required); in default of which the lot or lots so purchased may immediately be put up again and re-sold. 4.No lot or lots shall be removed from the premises before the sale, or till paid for, but each and every lot shall, immediately at the fall of the hammer, be considered as delivered, and be and remain in every respect at the absolute risk of the respective purchasers thereof, and shall be removed from the place of sale at the purchaserâ&#x20AC;&#x2122;s expense. 5.If any purchaser shall fail to comply with the above conditions, or any part of them, the Auctioneers shall be at liberty either to recover in full the amount of the lot or lots bought by such purchaser, without reference to any delivery or acceptance of the lot or lots other than first delivery by the fall of the hammer, or to re-sell any lot or lots bought by the purchasers, either by public or private sale; and the full amount of the purchase money at the present sale, or the deficiency (if any) arising from such second sale, shall be made good by the defaulter at the present sale, and be recoverable as and for liquidated damages. 6.No money will be paid to the proprietor for any lot sold, unless the account be cleared by the purchaser, and the Auctioneers will not be answerable for any deficiency that may arise on the re-sale of any uncleared property. 7.Animals are present on the sole responsibility of owners, whose duty it is to keep each exhibit under proper control at all times, whether in pen or in show or sale rings, or in transit within the centre. Neither the Auctioneers, the organisers nor the Sponsors, nor any of their officials or employees will be liable for damage or injury caused by any animalâ&#x20AC;&#x2122;s behaviour, including overnight. 8.Purchasers are to understand that, although every reasonable precaution will be taken to ensure the safety and welfare of the animals exhibited, the Auctioneers will not be reasonable for loss, or accidents of any kind, that may occur. Nor will the Auctioneers or vendors be accountable for any accident that may occur to any person attending the sale, whether as a visitor, or in any other capacity. 9.The pedigree, history and description of each animal is guaranteed by the owner, and no liability whatsoever us undertaken by the Auctioneers for the statements in the catalogue or announcements made at time of sale. The vendor who supplies such statements is alone responsible. 10.No undertaking of the Auctioneers or vendors or their servants to take charge of the lots or animals for sale, or to forward them to their destination, shall be held to impose any legal obligation or vitiate any of the foregoing conditions. 11.Any Medical Treatment to any animals must be advised by the Auctioneer for announcement at time of sale. The presence of any chemical or pharmaceutical substance in or on an animal or in its milk during the withdrawal period may render its sale void. 12.Should any question arise not provided for in the forgoing conditions, the decision of the Auctioneers shall be final, from which there shall be no appeal. 13.Neither the Auctioneers nor the sponsors incur liability of the return of Auction Fees where a claim is made for return of purchase price of any lot sold at the sale. 14.The sale will be conducted in Guineas. Purchasers will pay VAT on Fees. 15.After Sale release of livestock or goods is by Pass Out issued by the Sale Office. This also includes unsold lots. 16.Each and every lot must be presented for sale in the auction ring in catalogue or numerical order. No Sale may be contemplated before such presentation. Lots not sold in the auction or present for demonstration purposes and subsequently sold privately on the premises must be recorded through the auctioneerâ&#x20AC;&#x2122;s office and are subject to commission. 17.No electrical device may be connected to any socket in the show or sale premises unless it is fitted with an approved circuit breaking control. All equipment must be in up to date state of safety. Note: Sockets on sale rostrum are not suitable for blow driers. 18.Neither the Auctioneers, the Organisers, nor the Sponsors shall incur any liability for loss or inconvenience arising from postponement or cancellation of the event. NOTE: No animal is considered to be delivered to the Show and Sale until placed in the pen or place of tying allotted. Access doors will permit vehicles and trailers to enter the building for loading or unloading. Delivery to purchaser will also be effected when the purchaser removes the animal from the pen, or otherwise takes charge of the animal. Under no circumstances may any animal be taken out of the building for loading. The trailer or lorry must be backed inside the doorway and the screen doors closed the vehicle. Please remember to collect your Movement Permit before leaving. And please remember that a new purchase should be introduced to company when taken home â&#x20AC;&#x201C; and not placed in solitary confinement on arrival in strange surroundings after transport! N.B: All stock must be paid for on day of sale. Cheque facilities are only for approved customers:otherwise payment must be made by debit card, credit card or cash. Disclaimer The Suffolk Sheep Society accepts no responsibility for the accuracy of contributed articles or statements appearing in this catalogue and any views or opinions expressed are not necessarily those of the Suffolk Sheep Society, save where otherwise indicated. No responsibility for loss or distress occasioned to any person acting or refraining from acting as a result of the material in this publication can be accepted by the authors, contributors, editor or publishers. The editor reserves the right to make publishing decisions on any advertisement or editorial article submitted to this catalogue and to refuse publication or to edit any editorial material as seems appropriate to the editor. The Suffolk Sheep Society does not endorse any goods or services advertised, nor any claims or representations made in any advertisement in this catalogue. No part of this publication may be reproduced without the written permission of the Suffolk Sheep Society and publisher, application for which should be made to the Society office.